Sweet Zombie Buddha, how I loves me some Edith Wharton. This summer, I toured her old estate, the Mount, with the BF and his mum. While watching the information video in the stable before the actual tour, I learned that the Mount got its hands on Edith Wharton's actual library. I literally gasped when I heard this. While I don't think that a person can be defined by what they like (see this recent article at the AV Club for a more in-depth discussion this), I do think that a person's bookshelf is, not exactly a window, but maybe a freakily distorted kaleidoscope view into their soul. Books are like close friends you can bring into the bathtub without any awkwardness afterward, and you can tell a lot about a person by their friends. Seeing Edith Wharton's books in the Mount, even if I couldn't get close enough to touch them, made me feel like a part of her was still there. 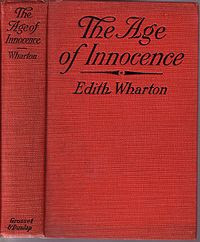 Last week, I re-read Edith Wharton's masterpiece, "The Age of Innocence," for which she was awarded the Pulitzer Prize in 1921. It's a story of unrequited love and frustrated dreams set in high society New York in the 1870s. Not a lot actually happens in "The Age of Innocence," but every event is dense with subtleties, with the meanings within meanings that float beneath the surface of a society obsessed with outward appearances. Wharton meticulously peels back the layers of meaning for her readers, stripping away the useless pleasantries and politesse to expose the emotional truth of her characters' lives. She holds their repressed desires up to the light like a huge and glittering gem, showing the reader everything they are afraid to show to each other. On the surface, "The Age of Innocence" is a love triangle: Newland loves Ellen, but is engaged to her cousin May. He can't leave May because that would ruin both of them, and he definitely can't go to Ellen, because she is already married and scandalously separated from her husband. What can be done about this impossible situation? Accustomed as modern readers are to a love that conquers all, "The Age of Innocence" is alarmingly pessimistic. Carefully, methodically, Wharton crafts a deep connection between Newland and Ellen that transcends the genteel hypocrisy of their public lives. With equal care, Wharton reminds us every step of the way why they can never be together. It's almost un-American, this idea that what we want most--and what is best for us--isn't what we end up getting. Wharton wrote this book in Paris, after all, in the aftermath of World War I, and there is something very French in the way her characters end up settling for less than what they truly want because they are unwilling to give up what they have. Whenever I read "The Age of Innocence," I compare it in my mind to Gabriel Garcia Marquez's "Love in the Time of Cholera." Both are stories of unrequited love, and both are (and this purely my own subjective opinion) perfect novels. They tell stories and contain characters and cultures so finely crafted, so complete, that I can think of nothing to add or take away, no piece of missing information that could make these novels more wholly themselves. A perfect novel is more like a human being in that way, more a living entity than a work of art. So when I find a really good book, a perfect book, it is, again, like acquiring a beloved friend who remains endlessly fascinating and continues to surprise.